The Extreme Networks B5 is a scalable, high-performance Gigabit Ethernet switch that provides support for the bandwidth-intensive and latency-sensitive requirements of today's demanding business applications. The B5 is an excellent choice for environments that require complete multilayer switching capabilities and support for high density 10/100/1000 Ethernet ports, cost effective10GE uplinks, dual IPv4/IPv6 management, basic routing and policy-based automation capabilities for advanced edge deployments. The B5 incorporates the new 802.3at high-power PoE on all ports, translating into increased power provisioning for power-hungry devices such as Pan/Tilt/Zoom (PTZ) IP surveillance cameras, IP videophones, third party 802.11n access points and virtual desktops. Built-in high-power PoE support is a cost effective alternative for customers in place of purchasing separate PoE midspans, which can take away valuable rack space, add cost and contribute more cabling to the wiring closet. The B5 provides high port density in a 1U footprint and is environmentally friendly by design. The B5's overall energy efficiency is further enhanced by a low current draw and an extreme tolerance for high environmental temperatures. A highly-scalable architecture and a comprehensive lifetime warranty ensure that a B5 network investment will sustain a secure, feature-rich and cost-effective network well into the future. The B5's highly customizable Layer 2/3/4 packet classification capabilities work together with the 8 hardware-based priority queues associated with each Ethernet port to support a suite of differentiated services with as many as 8 distinct priority levels to provide guaranteed Quality of Service (QoS) for critical voice and video network traffic. In conjunction with its non-blocking L2 switching and L3 routing architecture, the B5's intelligent queuing mechanisms ensure that mission-critical applications receive prioritized access to network resources. Extreme Networks B5 stackable switches address emerging business application needs such as automatically supporting voice, video and unified communications at an attractive price point. The B5 design incorporates redundancy and failure protection mechanisms complete with automatic failover and recovery capabilities to provide a reliable network. An integral power supply is the primary source of power for the B5 and complete power redundancy is provided by an optional external power supply. A virtual switch can be created by interconnecting as many as eight B5s in a single stack, which can be managed via a single IP address with redundant management connections. The B5's closed-loop stacking capability utilizes bidirectional switch interconnects to maintain connectivity within the virtual switch despite any physical failures, which includes switches, cables and connections. Flexible Link Aggregation Groups (6 groups of 8, 12 groups of 4 or 24 groups of 2) are supported which allow multiple Ethernet ports (8, 4 or 2) to be grouped together to create a LAG. A LAG's Ethernet ports can be co-located on a single B5 or they can be distributed across multiple B5s within a stack to prevent a switch-level failure from disrupting data communications. The B5 also includes Host CPU Protection support to help prevent Denial of Service (DoS) and BPDU attacks. Robust Quality of Service (QoS) features enable strong support for integrated multimedia networks, as well as all types of data-intensive applications. The B5 is a standards-based solution optimized for multimedia applications, including VoIP, videoconferencing and real-time collaboration. The B5 uses multiple standards-based discovery methods with Extreme Networks policy capabilities to automatically identify and provision VoIP services for IP phones from all major vendors. B5 switches provide dynamic mobility for VoIP clients to reduce operating costs; when an IP phone moves and plugs in elsewhere in the enterprise network, its VoIP service provisioning, security and traffic priority settings move with it, with no manual administration required. The B5 enables strong network security by utilizing its authentication and security features, which can be applied at the port level or at the user level. Making use of the Extreme Networks Network Management Suite's Policy Manager or a standard CLI, the Extreme Networks role-based architecture enables a network administrator to define distinct roles or profiles that represent operational groups within a business (e.g., employee, executive, guest, etc). Multiple users/devices per port can be authenticated via IEEE 802.1X, MAC address, or web authentication, and then assigned a pre-defined operational role. The B5 now supports increased password security via increased complexity, history tracking and aging. Passwords can now be encrypted using a FIPS 1402 approved algorithm. Administrators can easily transition from RFC 3580 and complex access control list (ACL) deployments to the Extreme Networks role-based policy framework in a seamless fashion, without the need to make changes to their RADIUS infrastructure (e.g., adding filter-ID). In addition, the B5 also supports ACLs for supplementary network security. Network operations can be easily tailored to meet business-oriented requirements by providing each role with individualized access to network services and applications (e.g., a guest should have different network access privileges than an employee). Utilizing Extreme Networks role-based policy, administrators are able to manipulate DSCP and 802.1p rewrite for classification and prioritization of network traffic. The B5 allows administrators even more network visibility, with the ability to audit their network for adherence to compliance regulations, such as PCI or HIPAA. The B5 is able to segment roles down to group levels, such as supporting a guest access role, helping to protect corporate applications and information. The B5 is a cost-effective, feature-rich, stackable switch that provides a broad set of features today and will continue to deliver benefits well into the future. All B-Series products include a lifetime warranty that includes warranty and support services for which many competitors charge additional fees – adding up to 10% of initial deployment costs on an annual basis. Included benefits, such as advanced hardware return, firmware feature upgrades (which most vendors cover at most for 90 days) and telephone support (which most don't include or severely limit) combine to significantly decrease operational costs for customers over the life of their network. The B5, with support for 32,000 MAC addresses, provides scalable, wire-rate performance in support of the bandwidth-intensive and delaysensitive requirements of today's demanding applications. Along with a switch capacity of 184 Gbps, the B5 provides up to 48 10/100/1000 Ethernet ports as well as two 10 GE ports. 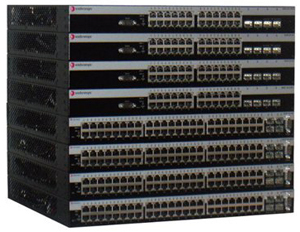 Leveraging the B5's stacking capability, as many as 8 B5s (both 24-port and 48-port combinations) can be interconnected in a single stack to create a virtual switch that provides 1.47 Tbps of capacity and up to 384 10/100/1000 Ethernet ports as well as 16 10GE uplink ports. Download the Extreme Networks B-Series Datasheet (PDF).